For your organization to thrive, your board of directors needs a consistent infusion of fresh ideas and new perspectives. And while turnover on your board can be disruptive in the short run, your long-run success depends on having a dynamic, engaged board that is willing to try new and innovative ideas. That’s why your organization should have term limits for your board of directors. However, while term limits are a best practice, they come at a cost. Board transition comes with a temporary loss of institutional knowledge, along with the risk of a board that wants a sudden change in strategic direction. 1. Engage in succession planning at the board level. While succession planning is often discussed at the staff level, it’s just as important to identify and develop future officers and directors. Ideally, new directors should have some exposure to your organization prior to joining the board. Asking volunteers to serve on a committee prior to serving at the board level is a good place to start. Serving on a committee is a great way for volunteers to learn how to lead with influence, understand how decisions are made via consensus, and demonstrate their commitment to serving in a volunteer role that comes with specific duties and requires regular meeting attendance. Committee are a good place for your officers and staff leadership to identify the next generation of board leadership. 2. Make sure you have an accurate record of board meetings and decisions. Accurate minutes give new directors a source of information that shows when and how certain decisions were made. In other words, minutes give your organization’s current strategy more context. Knowing when a decision was made and who made that decision helps give new directors clarity and insight. Serving on a board of directors can be like drinking from a firehose, but too often new directors have no idea who made the decision to point the firehose at their face, and when they made that decision. Minutes and meeting documentation can help new directors better understand what is happening in an organization, and why. 3. Always conduct an orientation for new board members. You should always, always conduct a face-to-face (if possible) orientation for new board members. That orientation should include a review of your organization’s strategic plan, review of a staff and volunteer org chart, a review of your organization’s conflict-of-interest policy, a review of the job description and attendance expectations of directors, a review of the organization bylaws, and training on how to use your organization’s board portal. Even if a new director is already familiar with your organization through service on a committee or some other form of volunteering, it’s still important to conduct an orientation. Without an orientation, new directors can feel lost and uninformed. Eventually an uninformed board member becomes a disengaged, ineffective board member, and the disengagement of one board member can quickly spread to other directors. Minutes Builder, a feature that allows you to keep track of attendance, minutes, resolutions, assignments, and votes during your meetings. Giving your new directors access to recent meeting minutes will give them a better understanding of current board strategy. SWOT Analysis, a collaborative tool that helps board members and other participating stakeholders assess the strengths, weaknesses, opportunities, and threats facing your organization. Even if the SWOT analysis was conducted prior to a new director joining your board, the written summary can still be available. Forms, a new feature that can help your organization create conflict-of-interest disclosures, job descriptions, and other documents new directors need to receive prior to attending their first official board of directors meeting. These features and more are available in BoardPaq’s Admin Center. 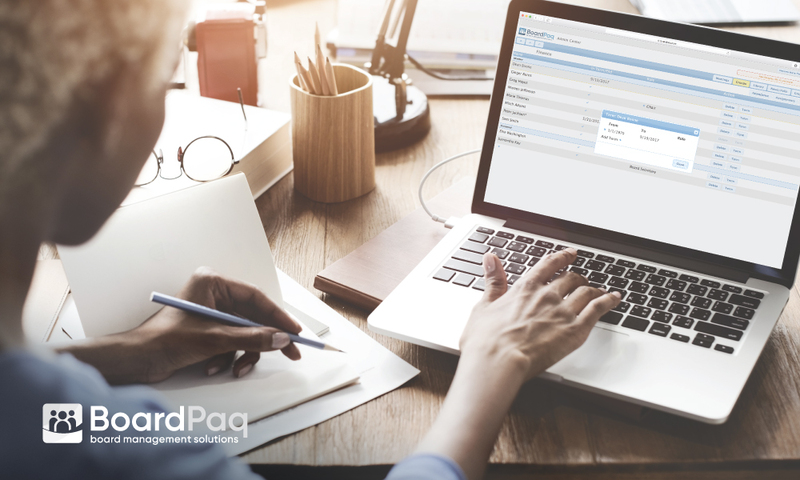 That’s why more than 1,000 school districts, trade associations, nonprofits, rural cooperatives, community banks, credit unions, economic development agencies, and other board-led organizations use BoardPaq to increase director engagement and run efficient, paperless board and committee meetings. Interested in learning more about the board portal of choice for cost-conscious organizations?